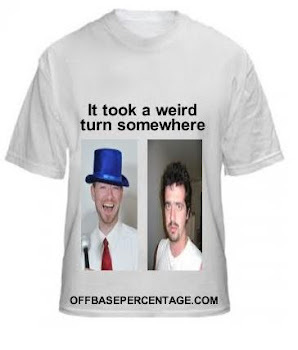 Off Base Percentage: Chase Utley Close To Return!!! The five-time All-Star second baseman returned to the team Sunday and appears close to being activated off the disabled list. Utley hasn't played this season because of tendinitis in his right knee. He played in his fourth straight rehab game Saturday night at Single-A Clearwater. He hit .281 with one homer in nine games. Utley declined comment before Sunday's game against Texas. The Phillies say Utley will meet with head trainer Scott Sheridan and team doctor Michael Ciccotti before deciding the next course of action. I've written ad nauseam about the lack of MVP support Utley has received over the years despite being the second best player in the National League behind Albert Pujols for much of his career. So I won't waste anymore space on that here. Utley only played in 115 games in 2010 and posted the lowest wOBA (a very respectable .373) of his career for a season in which he played over 100 games. He was still the fourth best second baseman according to fWAR (5.2) in 2010 even though he played in 39 fewer games than the third best and 45 fewer than the first and second. The Phillies must be almost as excited as me to get Utley back from the disabled list. Even though the Phils have the second best record in all of baseball, they're getting the second worst production from their second basemen (-0.6 WAR) besting only the Twins. Just to be clear, my letters to Chase Utley were nowhere as creepy as Mac's love letter. Well what the hell is Pete Orr supposed to do now?! I guess he goes back to waiting tables at Applebees.